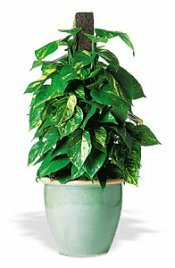 Not only are green and flowering plants a great enhancement to any home or office decor, they are also beneficial to your health. The results of a study by the National Aeronautics and Space Administration (NASA) show that common houseplants are powerful, natural air cleaners -- all the more reason why you want to keep your plants healthy with the proper care. Natural light is best, however, some plants also can thrive in office fluorescent light. Most flowering potted plants should be placed in areas with the most light in order to maintain good flower color and promote the maximum number of flowers to open. Foliage plants will do well under lower light levels and can be placed in areas providing reduced light. Plants should not be allowed to dry out or wilt. However, avoid overwatering; do not allow plants to stand in water. Avoid wetting leaves. Plants should be maintained between 65 to 72 degrees Fahrenheit for best performance.